The UCF Wind Ensemble has a new recording available featuring a piece inspired by Greek mythology. 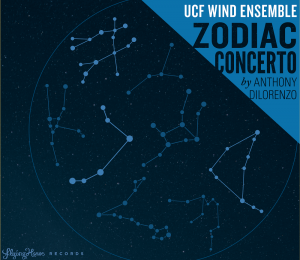 The “Zodiac Concerto” for solo horn, solo euphonium and wind ensemble by Anthony DiLorenzo brought together UCF students and faculty with professional musicians from around the country for this special collaboration. The 3-movement piece was performed by the UCF Wind Ensemble, led by UCF Director of Bands, Dr. Scott Lubaroff, at the 2018 UCF Celebrates the Arts and featured William Caballero (principal horn, Pittsburgh Symphony) and Roger Oyster (principal trombone, Kansas City Symphony, former principal solo euphonium, United States Marine Band: The President’s Own). They recorded the work earlier that same day in the Disney Theatre in the Dr. Phillips Center for the Performing Arts. The “Zodiac Concerto” started to take form in 2006 when “Gemini,” what is now the first movement of the piece, was commissioned as a solo show piece. Nearly ten years later, Caballero, Lubaroff, and Oyster pursued the expansion of “Gemini” into a full concerto based on Greek mythology. The album is available now via CD Baby and will soon be available on iTunes, Spotify and Google Play.